The EEHN Health Fair is back! 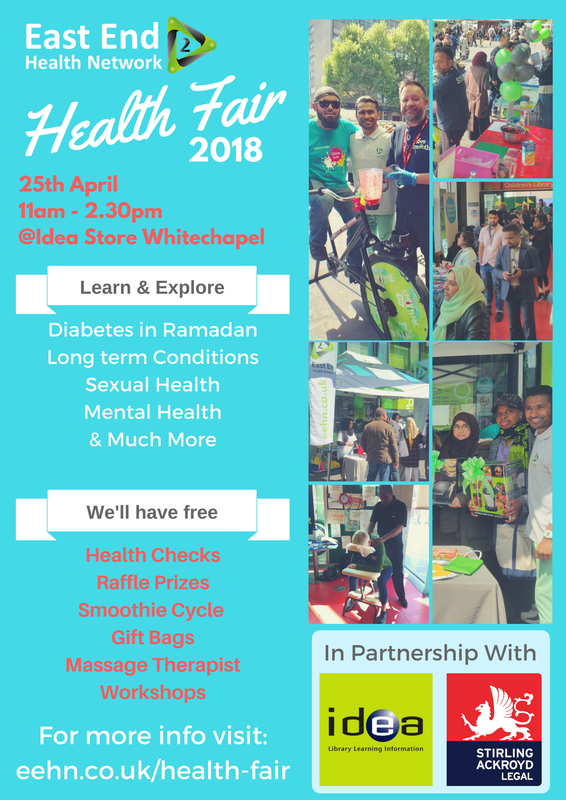 This year's Health Fair will be bigger and better with more organisations holding stalls and providing their specialised service and insightful workshops focusing Diabetes and how to manage it when fasting in Ramadan. 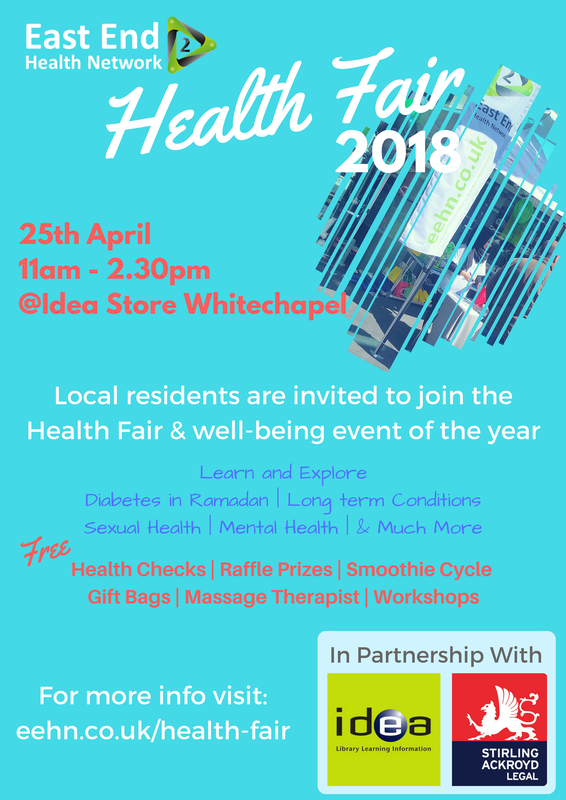 Join us on the 25th April between 11am - 2.30pm at the Idea Store Whitechapel. Save the date and bring all your family and friends. Contact us if you have a query? ​Quit Right Tower Hamlets can help you quit! We provide expert advice and support, together with state of the art medication. Quitting with our service will greatly increase your chances of becoming smoke-free. We provide expert, accredited advice and information to everyone affected by mental health problems. When mental illness first hits you or your family, it can be hard to know who or what to trust. We give people clear, relevant information on everything from treatment and care to benefits and employment rights. At Social Action for Health we are passionate to unlock the potential in people because we believe communities hold the power to their own health and wellbeing - and a healthier world. ​Healthwatch Tower Hamlets is here to find out what you really think about your local health and social care services. Your experiences should be at the heart of NHS and Social Care services and should influence any changes to come. ​LinkAge Plus is a unique outreach, support and activities based service for anyone over the age of 50 living in the London borough of Tower Hamlets. We aim to help and empower older people to achieve a better quality of life by improving well-being and reducing social isolation. Social prescribing is a service, for adults over the age of eighteen, that works with you to improve your health and wellbeing. Your local Community Linkworker is here to provide nonclinical support by linking you to community and voluntary services across the borough that best suits your needs. ​Tower Hamlets Recovery College runs educational workshops and courses. These are designed and delivered by people who have lived experience of mental health challenges, together with people who work in mental health services. We know that earlier diagnosis improves survival rates that why we are working directly with the NHS to drive improvement in cancer diagnosis, our work is a major part of Cancer Research UKs ambition to ensure 3 out of 4 people have their cancer diagnosed at an early stage. Our facilitators work with frontline clinicians such as GPs, Nurses and Pharmacists as well as people who manage and plan healthcare locally, we help health professionals understand their local cancer data, provide training and tools on key topics such as screening, share best practice and help organisations do in depth reviews of the care they provide. EastXchange is time banking project connecting people in the community based on shared interest. With us, you can exchange time, hobbies, skills and more. We believe that everyone has something to share, however big or small. Skills that are exchangde can be anything, the list is endless! Whether you are helping someone in the garden, offering companionship, teaching cookery, sewing, doing some DIY or teaching English, everyone’s time is valued equally. If you give an hour, your receive an hour in return.